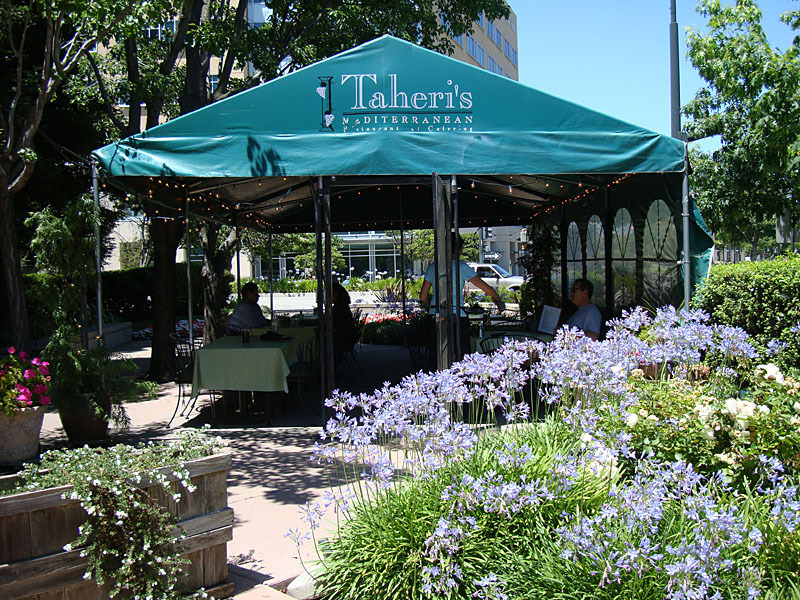 This is one of the few restaurants that are walking distance from our office. It has a bright airy interior with beautiful hand painted embellishments on the interior walls and tall arched windows which imparts an open, casual atmosphere. 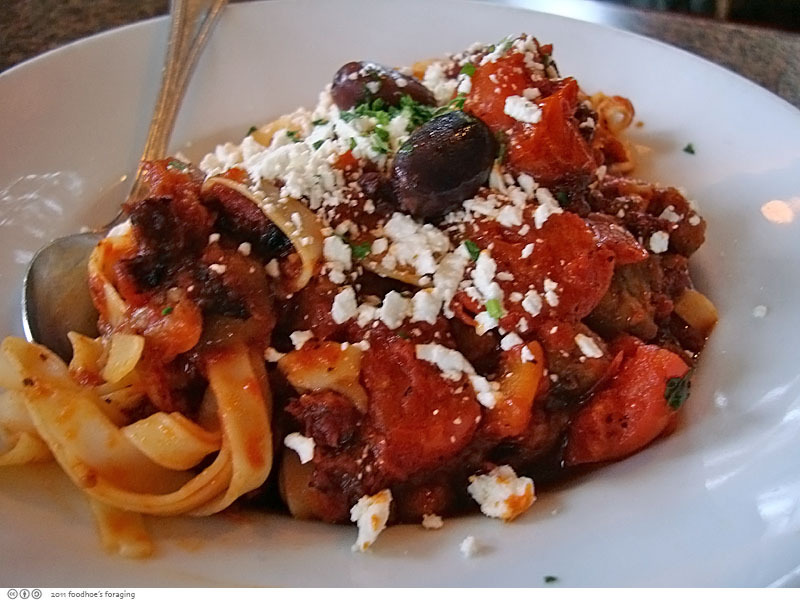 The menu features familiar selections from around the Mediterranean and has a wood burning oven which produces flat breads, pizzas and calzones with a delectable crust. I startled the staff by barging in with my camera clicking, but I was running late and in a hurry… Out here in this remote business park, it is a little unusual for the food paparazzi to show up I suppose. 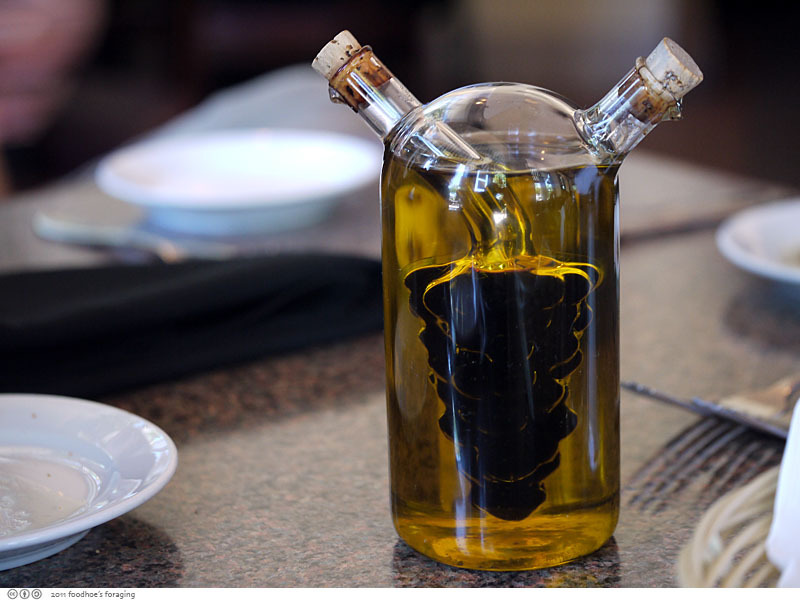 Each table has an intriguing glass decanter filled with both olive oil and balsamic vinegar that you pour out into shallow bowls to dip bread into. 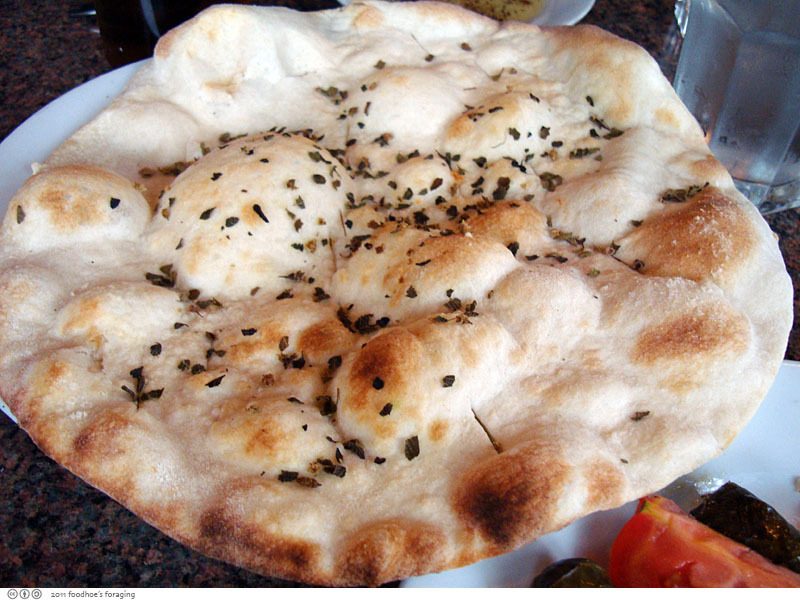 The crusty bread is freshly made and very fragrant from the flecks of rosemary baked inside the fluffy interior. It was very addictive, especially dipped into the olive oil and occasional swabs of balsamic vinegar. 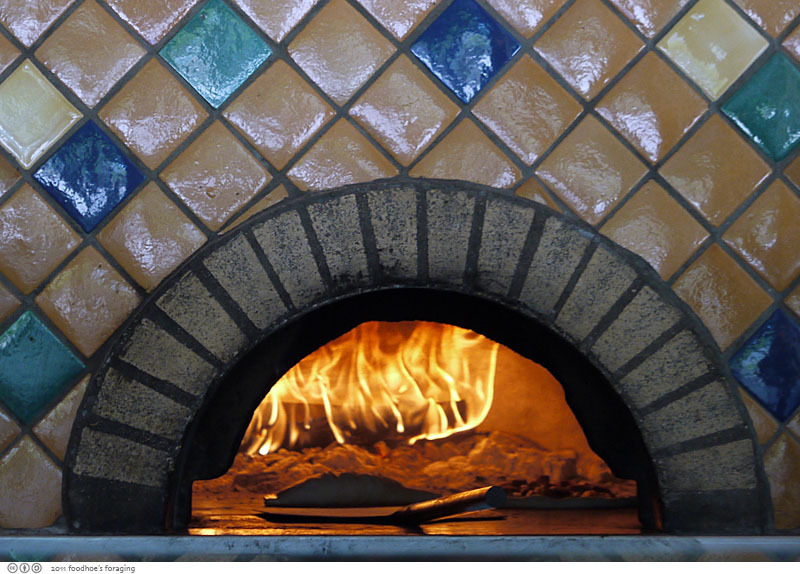 The wood-burning oven glows from the flames within and if you peek inside, you will most likley see something cooking on the hot stone surface. That’s our calzone . 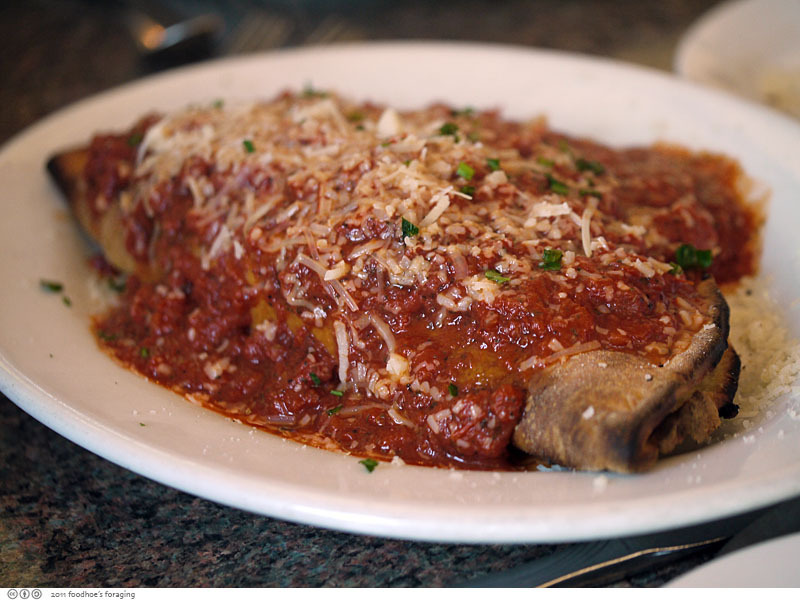 Nancy ordered the Calzone with ricotta and mozarella cheeses, sun-dried tomatoes, mushrooms, caramelized onion and spicy Italian sausage with marinara sauce (9.50). 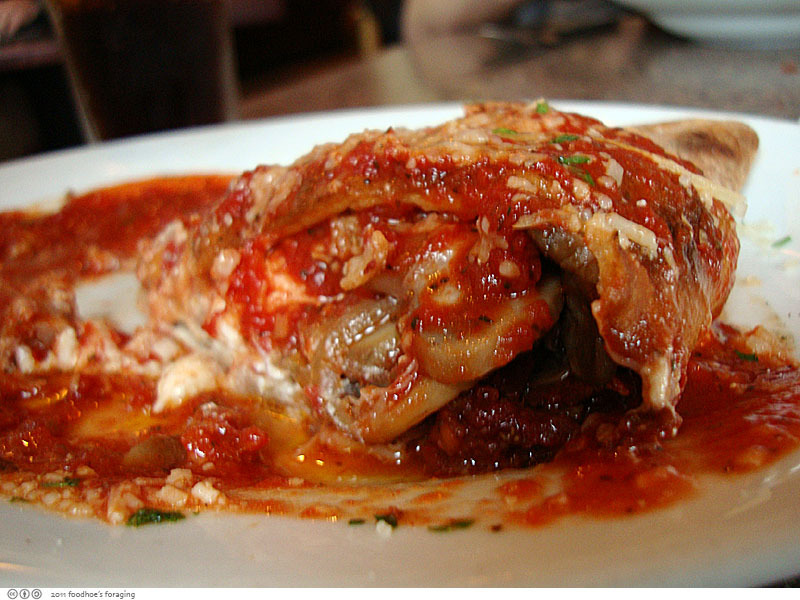 It is large, it looks like a medium pizza that is folded over, then covered with sauce and cheese. It’s a big cheesey thing, alot for one person. 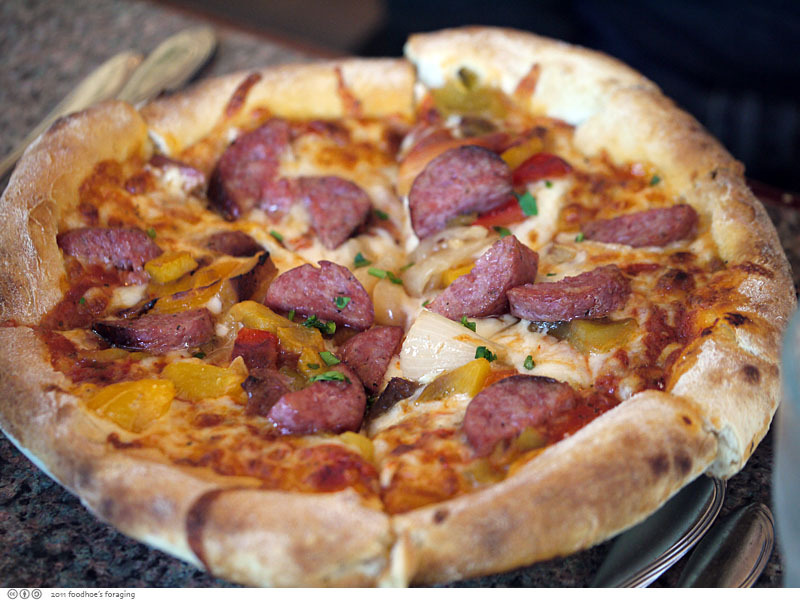 Thuan had the Pizza topped with Italian Sausage with artichoke hearts and caramelized onions (8.50). 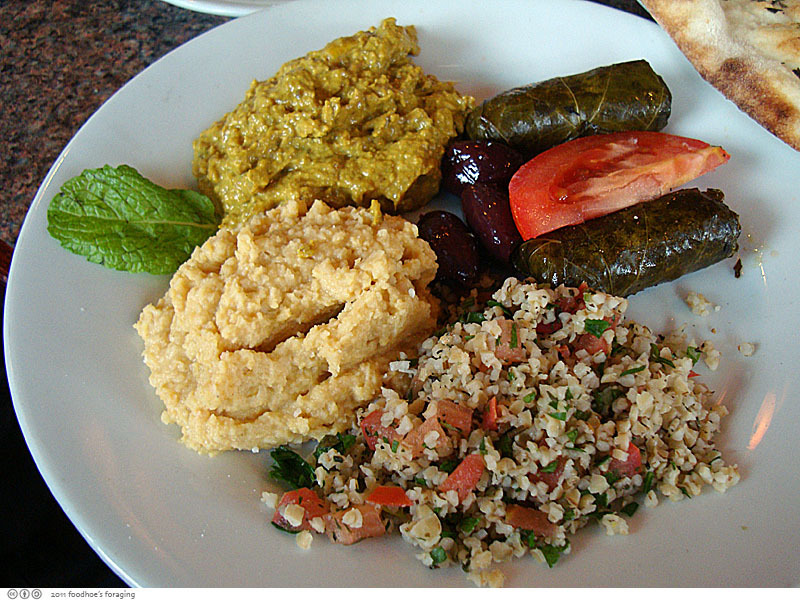 I had the Mediterranean Platter ($7.95) which comes with two dolmas, a mound of thick hummus, tabouli, eggplant puree that was fragrant with cumin and garlic, and a few briny kalamata olives. 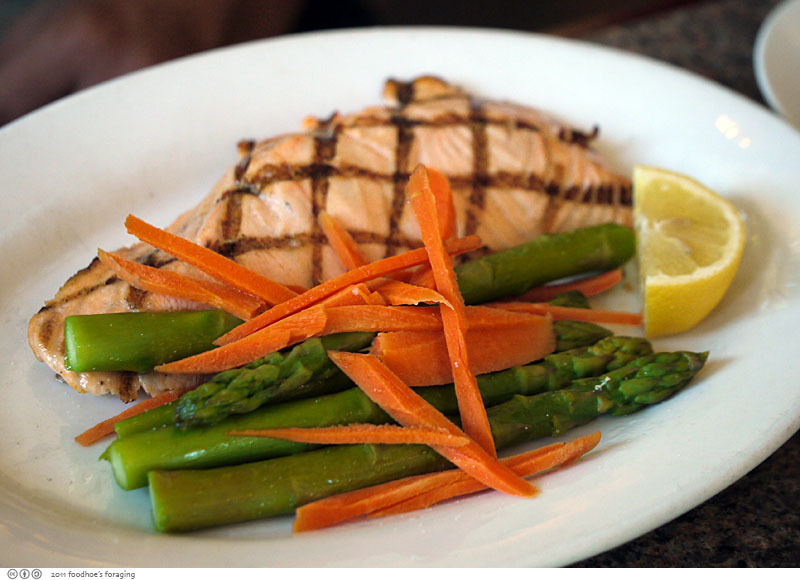 Shiraz ordered the Fresh Fish of the Day (Salmon) served with grilled vegetables, A.Q. on the menu translated to $20. A bit pricy and a rather large portion for a lunchtime entree we thought. I mean really, you know if you eat that you will be nodding off at your desk for the rest of the afternoon… It was served with fresh lemon slices and looked very spa-cuisineesque. 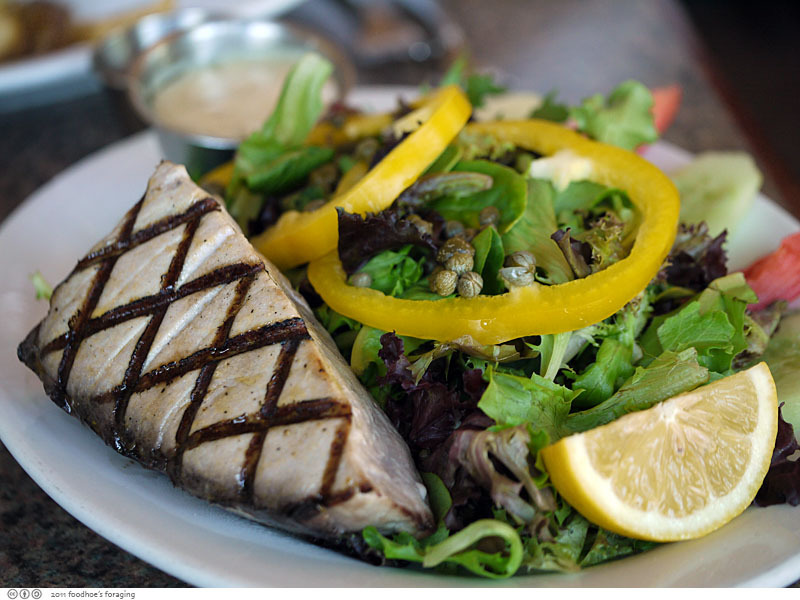 On another visit, I ordered the Seafood Salad – grilled fresh fish of the day (Ahi tuna) served with mixed greens, tomatoes, capers and lemon-thyme dressing (A.Q.) I dont’ know what A.Q. stands for, Italian for market price? This was $25. Huge portion, cooked perfectly but I couldn’t finish it. 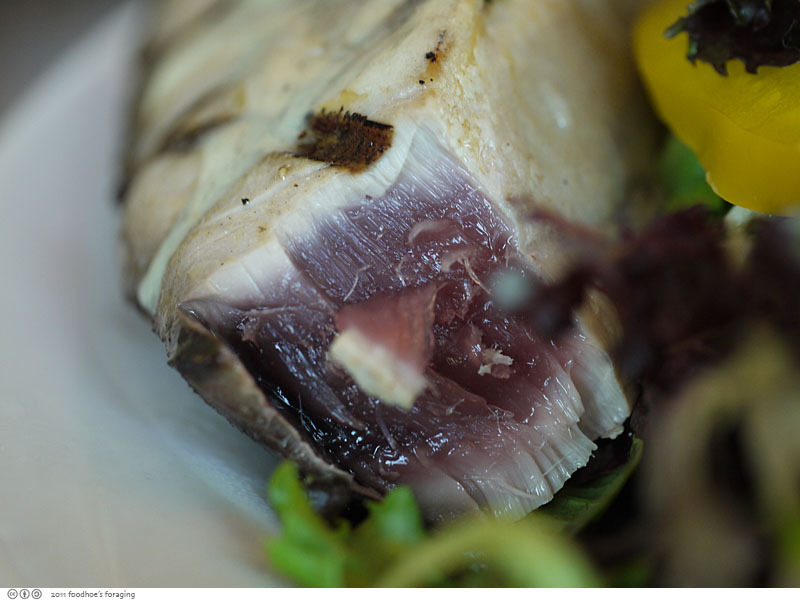 Since it was Ahi, they seared it, leaving the interior pretty raw, it was really delicious with the lemon and capers and tart and creamy vinaigrette. We agreed that they should have a smaller, less expensive portion for lunch. Did you get that Mr. Taheri? On the other hand, I could have ordered this with the prawns, which was reasonably priced at $11.50. 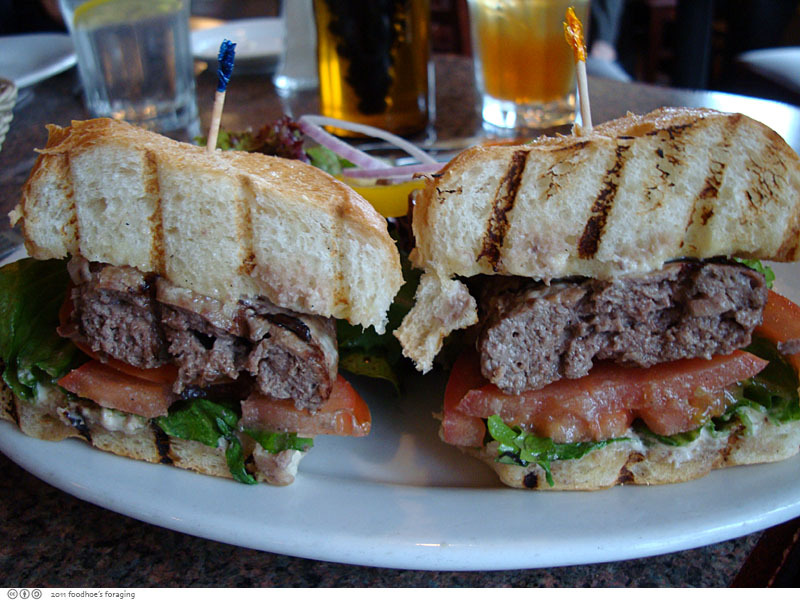 Russell had the Lamb Burger – freshly ground lamb served on a seeded roll with lettuce, tomato, and dijonaisse (8.95). He said it was all right. 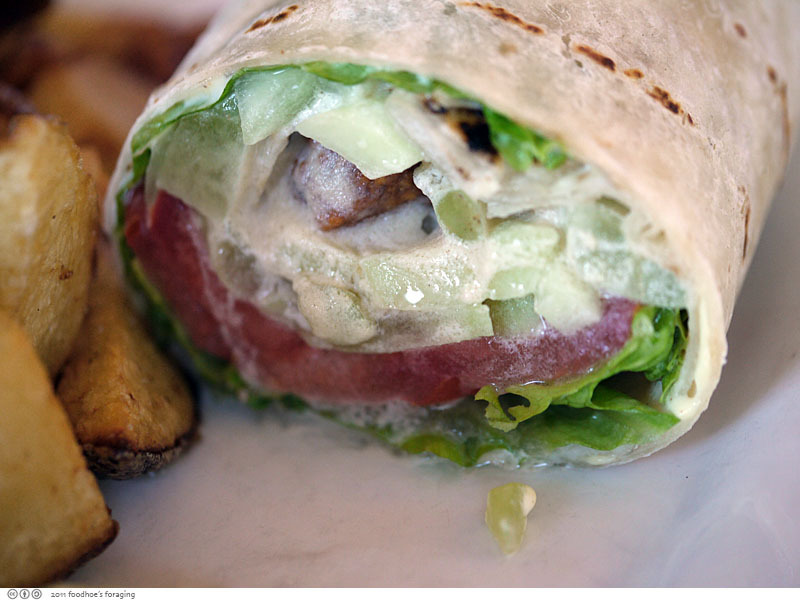 Dustin had the Falafel wrap – falafel balls with lettuce, tomato, cucumber and Tahini dressing served on flatbread from the wood-burning oven (8.50) Looks like a burrito with fries. 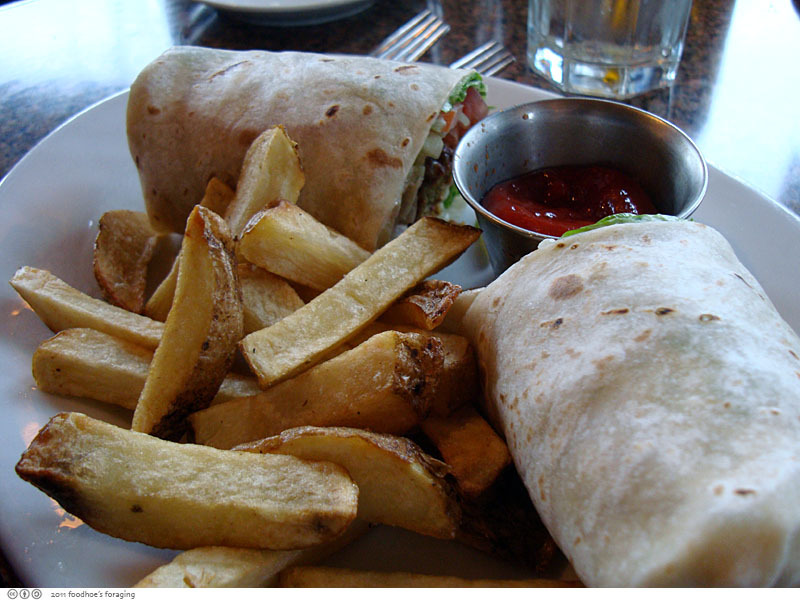 But inside are falafel balls, cucumbers and yogurt sauce, definitely not a burrito. 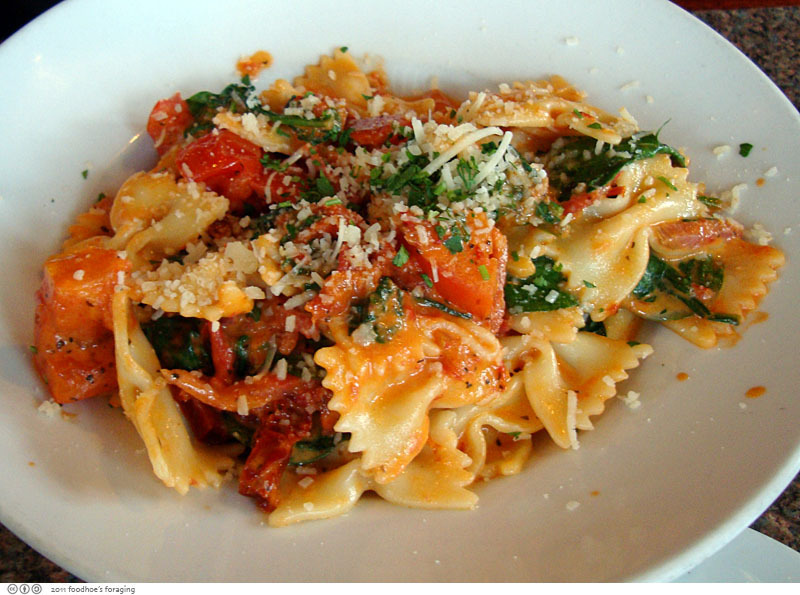 He said it was all right, but ordered it the next time we came, so he seemed to like it. 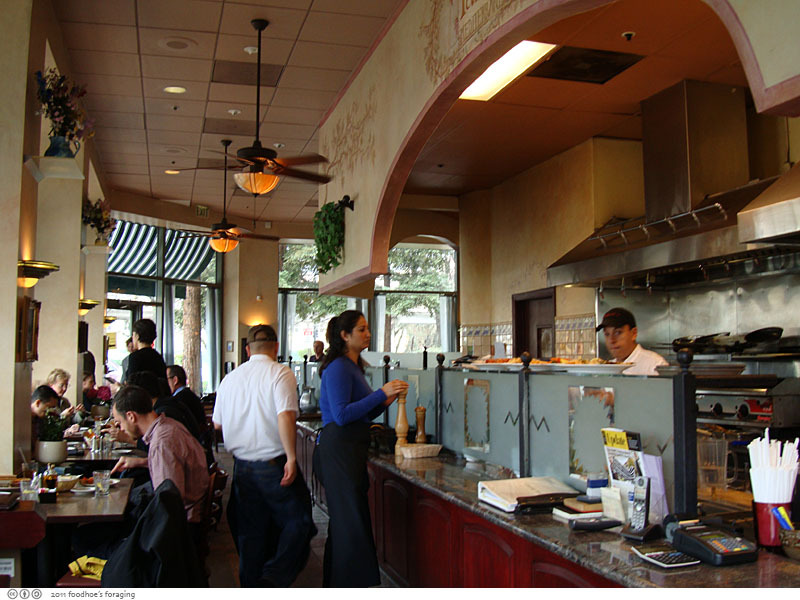 So, overall the food is pretty good to very good, the setting is quite nice and the location is very convenient for those working nearby. But for all that and the prices charged, you would expect better service, which was not very attentive and slow. It is not possible to dine here if you are on a strict hour lunch, but I imagine it must be less busy for dinner. The location is off the beaten track with no street parking, but you can park in the adjacent lot and get your ticket validated for 2 hours. Nice fresh-looking food! A lovely restaurant. That Oil and Vinegar Bottle is adorable! 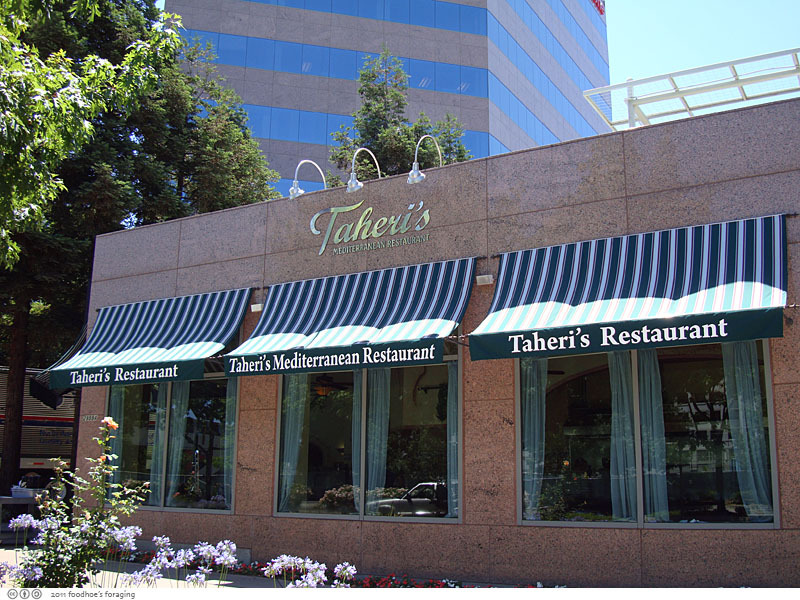 I’ve loved Taheri’s since I used to go there with my mom when she worked at the old Levi’s building in Walnut Creek. And I had no idea you worked in the area! Please tell me it’s the giant insurance company that’s moving half of its office to Emeryville…. good choice, getting the platter–that’s the type of thing i always look for on a menu. 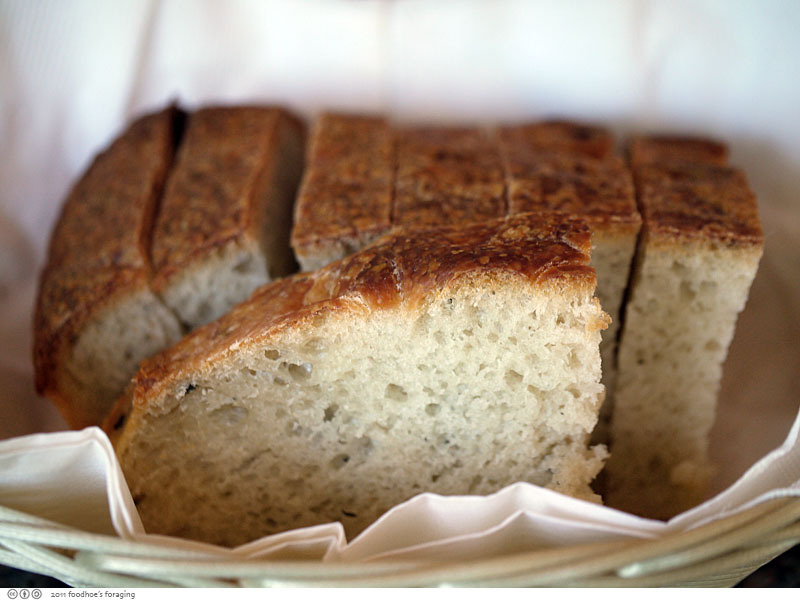 a little of this, a little of that, and some awesome bread to boot! grace, I am always drawn to the platters!